I am not a doctor, naturopath, or aromatherapist, and this post is based on my own research and personal experience using essential oils. Essential oils are not a ‘cure’ for autism, sensory processing disorder, or any other developmental or mental health disorder, and the information provided in this post is not intended to replace the advice of a licensed healthcare provider. While essential oils have been used therapeutically for thousands of years to ward off illnesses, improve immunity, promote proper digestion, and alleviate pain, essential oils for autism are only just gaining popularity as an alternative way to support children on the autism spectrum as well as those with sensory processing challenges. One in every 68 children is diagnosed with autism each year (source), and more and more parents are turning to more natural approaches to treat the symptoms of their child’s disorder(s). From dietary changes and supplementation, to homeopathy and Traditional Chinese Medicine, there are so many different approaches you can take to help your child naturally. Of course, having so many options to choose from can be extremely overwhelming. It may be tempting to try all of them at once, but if your child were to have an adverse reaction to one or more treatment plan, it would be difficult to figure out the exact cause. A good rule of thumb is to choose one treatment option at a time so you can properly evaluate how your child responds before adding another one. For the purposes of this post, we’re going to take a deeper look at essential oils for autism and how they can be used to help manage and alleviate some of the negative symptoms and behaviors associated with autism spectrum and sensory processing disorders. Simply put, essential oils are the [naturally occurring] oils of the plants from which they are extracted. Used in perfumes, aromatherapy, and other flavorings, essential oils are a ‘volatile liquid’ obtained through the distillation of plants, and they are gaining popularity for their wide range of healing properties. How should essential oils be used? There are 3 ways to use essential oils, although ingestion is rarely advised unless it is under the recommendation and supervision of a trained medical professional. Inhalation. Diffusion is perhaps one of the easiest ways to use essential oils. Whether you choose to use a diffuser (I love my doTERRA Lumo Diffuser), inhale oils applied to a piece of cloth, or mix them into a spray bottle to mist onto your clothing or furniture, the act of inhalation will activate your limbic system by way of your olfactory nerve, and the effects can be pretty powerful. Some oils can create a sense of calm, whereas others can leave you feeling energized. The possibilities are endless! Absorption. When applying essential oils topically to the skin, a carrier oil such as coconut oil or grape seed oil must be used to dilute the oil (direct application to the skin can be dangerous), which helps decrease skin sensitivities and increase absorption. A person’s height, weight, and age should be taken into consideration when applying oils to the skin, and aromatherapists recommend starting at the lowest dose and then increasing over time based on individual reactions. Ingestion. To avoid toxicity, ingestion of essential oils should only be done under the direction of a qualified professional. Quality matters. Some manufacturers use chemicals during the extraction process, which can alter the purity and effectiveness of their oils, so while it may be tempting to purchase your essential oils from a cheaper supplier, you may be doing yourself and your child a disservice. Based on my research, doTERRA and Young Living are among the top-rated companies that supply essential oils for autism. Less is more. Essential oils for autism can be very effective, but remember that more is NOT better. Start with a higher dilution rate to start with, and then adjust as needed. Use a carrier oil. If you are applying oils to the skin, always dilute with a safe carrier oil like coconut oil or grape seed oil to avoid burning the skin and other potentially hazardous effects. Dosing should be based on height, weight, and age, so be sure to speak with a qualified professional to determine the correct dosage for your child. Check for medicinal interactions before use. Since some essential oils can interfere with certain medications, make sure to discuss the safe use of autism oils with your child’s doctor. Be cautious of sensory sensitivities. Children with autism and sensory processing disorder are known to have certain sensory sensitivities, and it is possible your child will react positively or negatively to the smell of certain oils. If your child dislikes the smell of a particular oil, do not force it upon her, and instead let her sample many different oils to find the ones she can tolerate. You may also consider applying diluted oils to the soles of her feet at night to avoid an adverse sensory reactions. Store oils in a glass container. If you’re creating your own blends with a combination of different oils, make sure you are storing them in a glass container as they may become contaminated with toxins and other harmful substances if they are stored in plastic containers. Keep out of reach of children. Always store your oils in a locked cabinet your child cannot access. Do not use while pregnant or breastfeeding except under the guidance of a trained medical professional. How can essential oils help children with autism and sensory disorders? Essential oils for autism and sensory processing disorder can have so many positive effects for children and their families. The calming effects of lavender oil can help kids sleep better, bergamot oil is a powerful relaxant and can reduce nervous tension, anxiety, and stress, roman chamomile oil can reduce mental anxiety, paranoia, and hostility, and is also a great stress-buster that has been found to help with insomnia and muscle tension, and jasmine oil works to regulate feelings of stress, anxiety, and over-excitement in the brain. And that’s just breaking the surface! There are HEAPS of different autism oils and blends you can experiment with to help your child with her specific needs, and we’re sharing our favorites below. What are the best essential oils for autism? There are heaps of single oils you can purchase to help support your child with autism and sensory processing disorder, and you can combine them together to make your own blends based on your child’s individual needs and struggles. I’ve outlined 8 basic oils below along with the symptoms they help treat, and I’ve included affiliate links to purchase them on Amazon.com for your convenience. Please note that I use a combination of doTERRA and Young Living oils – both of which offer 100% pure, natural, and authentic oils – and I’ve only linked to products offered by doTERRA and Younge Living to ensure I am recommending top-of-the-line products. I am NOT an affiliate of either company, which is why I have included affiliate links to purchase the oils individuals through Amazon.com. Please refer to the product information for each oil/blend for proper usage instructions, and consult with a trained professional to ensure the oils do not interact with any medications you or your child is taking, and that you are administering it properly for your child’s height, weight, and age. Lavender oil soothes the body and mind to help kids sleep better, and since autism and sleep can be extremely challenging, this is a great oil to get started with. Pepperment oil improves focus and mental performance by stimulating the brain for better concentration. Bergamot oil is powerful relaxant and can reduce nervous tension, anxiety, and stress. Roman chamomile oil can reduce mental anxiety, paranoia, and hostility, and is also a great stress-buster that has been found to help with insomnia and muscle tension. Wild orange oil is a great mood booster. By relaxing the nervous system, it reduces stress and promotes feelings of happiness. Jasmine oil works to regulate feelings of stress, anxiety, and over-excitement in the brain. Vetiver oil calms the sensory system and helps to stabilize emotions, and can also have positive effects on sleep. Frankincense oil helps reduce feelings of stress, anxiety, and anger, and also improves brain function. If you are interested in using a blend of oils, but aren’t comfortable making your own blends at home, both doTERRA and Young Living offer their own signature blends. I’ve included information and links to purchase 7 my favorites on Amazon.com below. dōTERRA Peace® Reassuring Blend. If your child suffers from anxiety, this is a great blend as it helps to promote feelings of peace and reassurance. It can help calm children at night, as well as offer comfort before an anxiety-producing event. dōTERRA Serenity® Restful Blend. If sleep is a challenge for your child, the calming and relaxing effects of this blend can be felt almost immediately. dōTERRA Breathe® Respiratory Blend. If your child has trouble sleeping due to a cold or respiratory illness, or suffers from seasonal allergies that makes breathing difficult, this is a great blend to consider. Peace & Calming®. This is a great blend to use in the home to create a feeling of peace and calm, and can be a great addition to your child’s nighttime routine. Release™. If your child struggles with anger and frustration, this blend can help her let go of those feelings and feel more balanced. Thieves®. While not exactly an essential oil for autism, this is a great blend to include in your starter kit to help relieve colds and coughs. It’s one of the most popular blends among my mom friends, and since the symptoms of autism tend to be worse when our little ones are sick, this is a great blend to keep on hand throughout the year. Valor®. This is another popular Young Living blend as it helps soothe and balance emotions, which can be extremely beneficial in helping children on the autism spectrum start and end their day on a positive note. A wise person once said, ‘even one small drop can make a ripple in the water and one small decision can affect your life in the simplest way.’ I love this quote because it reminds me that sometimes the smallest changes in our lives can have the biggest impact, and I hope this beginners guide to essential oils for autism and sensory processing disorder inspires you to find natural ways to support your child. Remember to do your research, commit to ONE change at a time, and never give up hope. 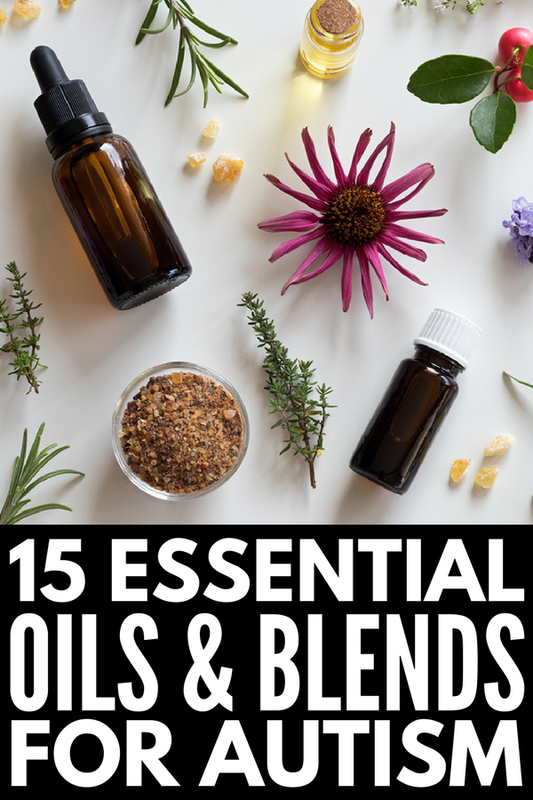 If you found this beginners guide to essential oils for autism and sensory processing disorder helpful, please share this post on Pinterest! And if you’re looking for more autism-related tips and tricks, please follow our Autism & SPD board where we share all kinds of fabulous things we find each day!